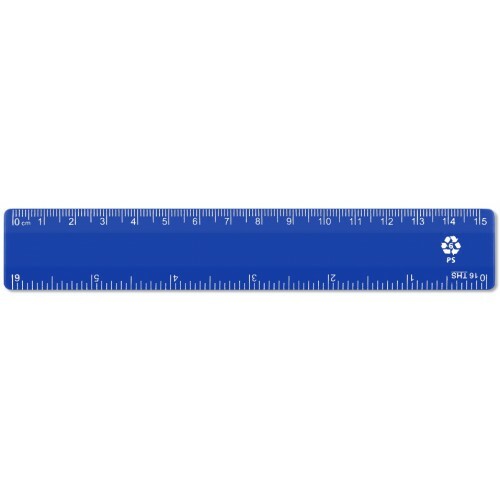 Compact enough to fit in pencil cases, the Blue Recycled Plastic Ruler is ideal for schools, offices and personal use. The flexible 15cm body has been made using recycled plastic - providing durability alongside a minimised carbon footprint. In turn, once the ruler has reached the end of its life, it can be recycled once again. Each of the four corners has been rounded for safety and a flattened base allows it to sit flush against both paper and flattened surfaces. The entire body is coloured a deep and rich navy blue. This can be used to signify a house colour, personalise your stationery kit or simply stand out among the other rulers in your collection. To ensure the clearest legibility, those classic line and number markers used to individual distance are printed here in a bold white colour. This allows them to be read from a distance, by all different individuals and returns an accurate measurement every single time. Simply line the markers up with those on your paper and either draw the perfect line or make a note of the distance recorded. This ruler is a versatile option for all environments and has the strength to withstand repeated use. We provide these essential tools in larger bulk quantities. For orders over 10, our rulers have an individual unit price of just £0.22. For larger orders over 100 rulers, each unit price can be provided at just £0.16 per unit. In offering these discounts, we strive to ensure every business is able to keep their stocks up and work within their budget.